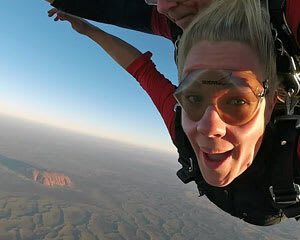 Skydiving is number one on many bucket lists and a visit to Uluru (Ayers Rock) is another box many people want to tick so why not combine the two with a tandem skydive over Ayers Rock? Grab your best mate and save on a spectacular tandem skydive over the magnificent Ayers Rock (Uluru). You will check in and meet your tandem master to go through some simple training before jumping into the plane for an incredible scenic flight up to 12,000ft. As you climb, take a moment to appreciate the amazing views of Ayers Rock and Kata-Tjuta before the Adrenalin really starts pumping. At 12,000ft it's jump time! You and your tandem master will exit the plane and enter the rush of freefall reaching speeds up to 200km/h over the Red Centre. Then the parachute is deployed and the whole experience takes a change of pace, now you can catch your breath and start to take in amazing views in all directions including the world famous Uluru (Ayers Rock) and the spectacular Kata-Tjuta. Book now for a sensational skydive! Ayers Rock team were fantastic, no better place to do this and have written so on Tripadvisor.